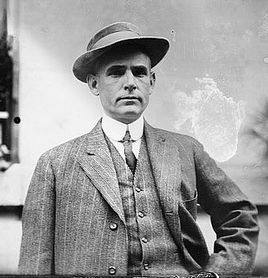 “A ‘cub’ reporter in Chicago strayed into the clutches of the Rube one afternoon and impressed the great pitcher with the fact that he must have something startling in the way of news or be apt to lose his position. 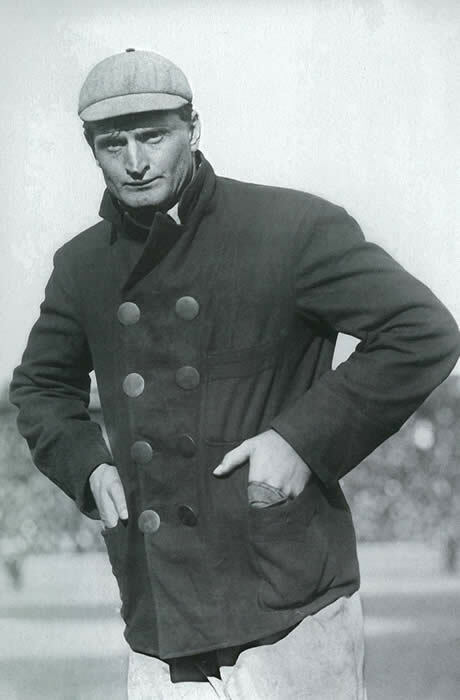 “(T)uring over in his mind the thought that Mack was gambling with his players, Lave Cross was the wild man and that Monte Cross was the real culprit when it came to tapping the paint. He whirled off a story on the machine and handed it to the sporting editor. That dignitary looked at the cub, scratched his head and kindly asked the youth where he secured his information. 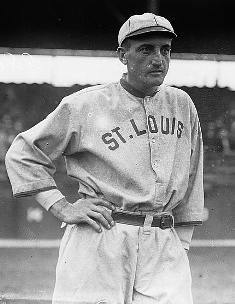 “Edward ‘Rube’ Waddell, pitcher for the old Philadelphia Athletics, was one of baseball’s zaniest ‘characters.’ It was in an exhibition game in 1902 that he pulled his most famous stunt. As with all Waddell stories, there was some truth and a good deal of embellishment in Considine’s account. 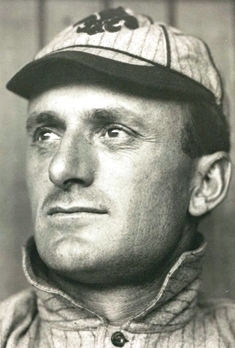 While the contemporary coverage of the game differs on some aspects of the performance, they all agree that Waddell pitched to just one batter after members of the team left the field in the ninth inning. The game in question was played in 1903 at Steelton, Pennsylvania against that town’s YMCA team. 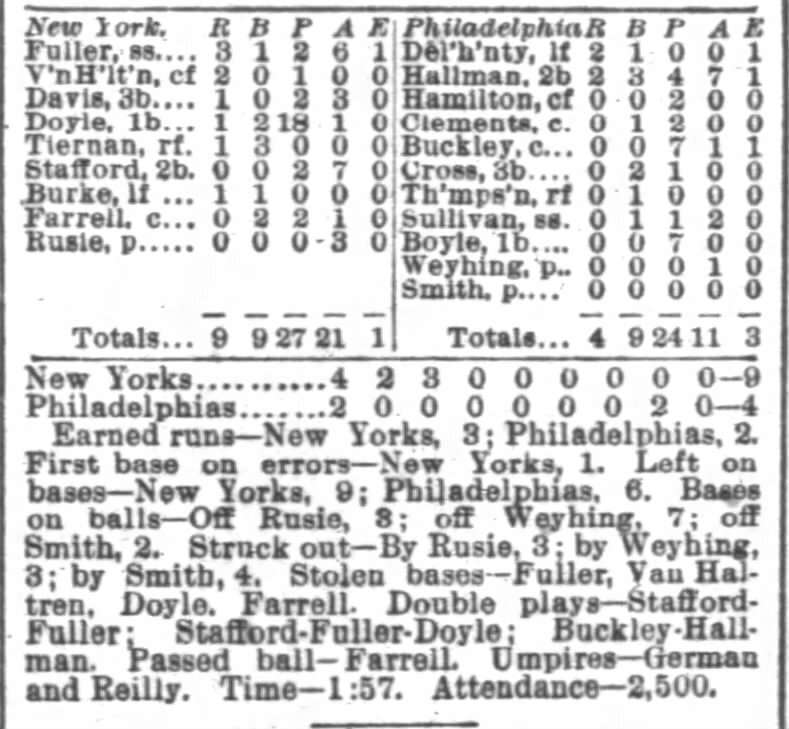 The Athletics won easily, 10 to 2, and Waddell pitched the eighth and ninth innings for Philadelphia. 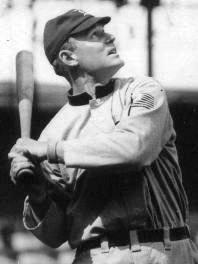 Waddell gave up another hit in the eighth and the YMCA scored a run. 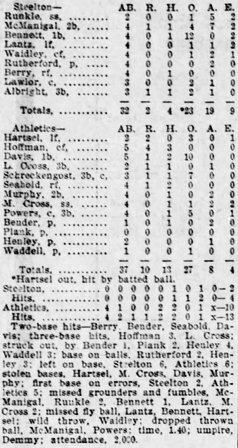 “The Athletic players behind Waddell left the field and with a man on third base he and (Ossee) Schreck (Schrecongost) were left to put out the side. Considine likely cribbed his version from Harry Grayson, the sports editor of The Newspaper Enterprise Association syndicate. Grayson told the three-batters-nine-pitches story several times throughout the forties, and that legend stuck. “In the past few years Yale and Harvard and Princeton and other colleges have employed coaches to teach them how to hit. 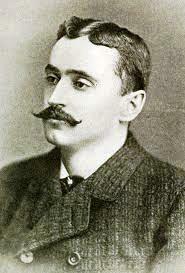 The experiment was futile, and no hitters were developed that did not already possess the gift. “Sam Mertes of the Giants invariably pulls his left foot back as he swings at the ball. Mertes also crouches with somewhat of a forward lean and keeps his feet wide apart. 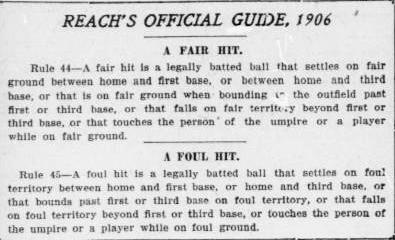 “Roger Bresnahan and Mike Donlin, two of the greatest hitters in the world, are what are called vicious swingers. Bresnahan has absolutely no fear. He never thinks of being hit, but runs squarely into the ball, and when he plants his bat squarely against it a scorching line drive follows. Nobody hits a ball with more force than Bresnahan. “Donlin stands with his feet about one foot apart and usually holds the bat perfectly rigid at his waist, slanting at an angle of about 45 degrees. He can either ‘chop’ or swing hard with the same degree of accuracy. 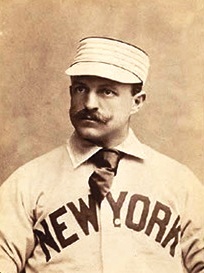 Donlin is said to be the greatest natural hitter in the business. He says he has no idea how he does it. 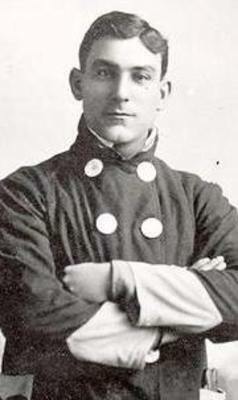 “George Stone, one of the most remarkable batters of the age, has a (boxer Jim) Jeffries crouch at bat which has caused experienced baseball managers to say George wouldn’t last as soon as the pitchers got next to him. Stone puts a terrific amount of weight into one of his blows, swinging with his shoulders and smashing a line with fearful force. 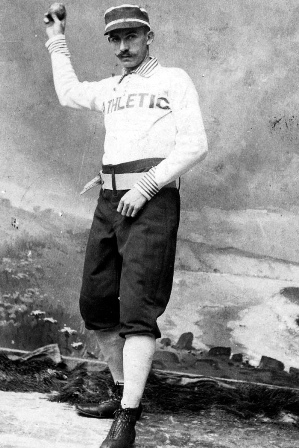 “His position has been termed awkward, inelegant, and not conducive to good hitting, but Stone to-day leads the American League with a better average than the great (Napoleon) Lajoie. “Larry is the personification of grace and elegance at bat. He has that careless indifferent method which attracts, is devoid of nervousness but active and alert. 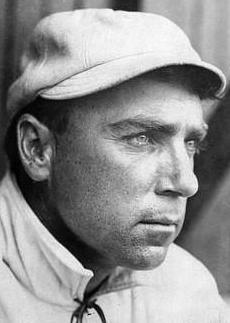 Infielders will tell you that there is a force in the balls smashed by Lajoie which makes them unpleasant to handle. Lajoie is the finished artist. “His great rival in the National League Honus Wagner is just the opposite. Hans grabs his stick at the end, holds it high about his shoulders, and when he swings his legs are spread from one end of the batter’s box to the other. Wagner is awkward standing almost straight and goes after outcurves and drops with equal avidity. Hans often reaches to the far outside of the plate for a low outcurve and plants it into right center field. Upon the Polo Grounds at length. Resembled some fair eastern clime. What player could but do or bust? To warm up with a practice burst. By practice with their batting pin. When told to take the pitcher’s box. Gus Weyhing started for Philadelphia. Their frozen legs thawed quickly out. Were much like Boston in their play. In practice quite up to the spot. They let proceed and did not stay. Again was forced the bench to seek. And homeward to the plate he reeled. And Delehanty took his place. The Giants showed up very well. Their work was shop and clear’s the bell. Four thousand people saw them play. With Reilly for his pal, be gob. Big Delehanty came to bat. That Stafford stopped, but on the run. Was caught by Staff—Good eye! Good eye! And stood triumphant on third base. Who dropped it, to the rooters’ wrath. By force at third produced a shout. He threw to Doyle and Sully quit. And went to first by easy scoots. To second where he took a seat. And Van was forced because of it. His single hit the fence, that’s flat. Fuller scored and David stirred\His stumps and landed safe on third. Tiernan’s hit scored Davis too. Staff went to first on balls, hurroo! And skipping down to first he went. Enabled Doyle and Mike to score. Then Farrell climbed the second stair. ‘Twas no use. Rusie fanned the air. He didn’t fail to do his half. Who didn’t let the good thing spoil. Then Weyhing also fanned the air. Thus Rusie evened things for fair. And made the third man out to boot. And Buckley went behind the bat. Van Haltren gets his base on balls. In this respect Cap Davis vied. The bases were all occupied. And like a rabbit crossed the plate. Van Haltren also scampered home. Then Stafford missed the fatal strike. At second Hallman caught our Mike. Which Rusie let go like a shot. And Amos hid his blushing face. And Hallman took bag 2 on it. Hallman went to avis’ soil. Touched first bad with his Trilby boot. A single the resultant yield. Rose up and cheered their hero’s name. Got up and duplicated it. And quickly down to first base flew. Which forced Ed Burke home on the spot. But Buckley tapped him on the back. Doyle smashed a single out to right. Two runs came in –‘twas out o’ sight! And perished tamely at first base. Let him to first—the little runt! Who touched bag 2 midst much applause. Was caught far off his base for fair. By nabbing Weyhing’s hit. No run. And Smith tried pitching—that’s the stuff. And fanned out, much against the law. He plugged it down to first with vim. Burke found the ball ahead of him. And took a back seat calm and nice. He didn’t know where he was at. Who took it in with airy grace. And Hamilton was likewise curst. And Buckley gobbled Fuller’s foul. The latter safe on first did sit. Gosh, Van was in ir! By going out at first. No run. Van Haltren kept Cross’ fly off soil. And the Phillies retired without a run. And on the bench resumed his place. And beat the ball two feet about. And Burke went out as slick as pie. Ahead of him at first he found. Boyle died at first in style as slick. ‘Twas Fuller this time who did the trick. Rusie attended to Smith’s weak hit. The Quakers were certainly not in it. And Rusie fanned the air once more. Then down to second quickly runs. Who batted like a pygmy man. And Delehanty ran clear home. And Hamilton to first on balls. Buckley out at first by tag. And Hamilton off second bag. And scored on Cross’ hit—hooray! And Cross to third base quickly spieled. Sully smashed along the ground. The ball at first ahead he found. And Hamilton took care of Doyle. Forced him at second—made him laugh. The crowd yelled a triumphant burst. To sum it up, the game was great. The rooters left the grounds elate. For every one had cash to burn.